Harley Funk, 4, digs in the Riverhouse Children’s Center garden, which includes lettuce, tomatoes, radishes and carrots. While the garden is fun for the kids, it’s providing healthy nutrition and experiential learning, too. 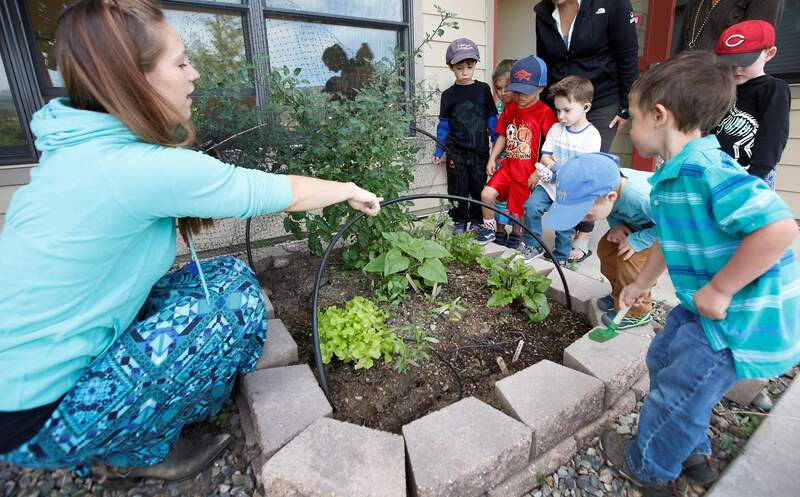 Angie Downing, a teacher at Riverhouse Children’s Center, works with children in their garden. One of the reasons for gardening with such young children is teaching healthy lifestyle habits and combating childhood obesity – more than 20 percent of children younger than 5 are overweight. 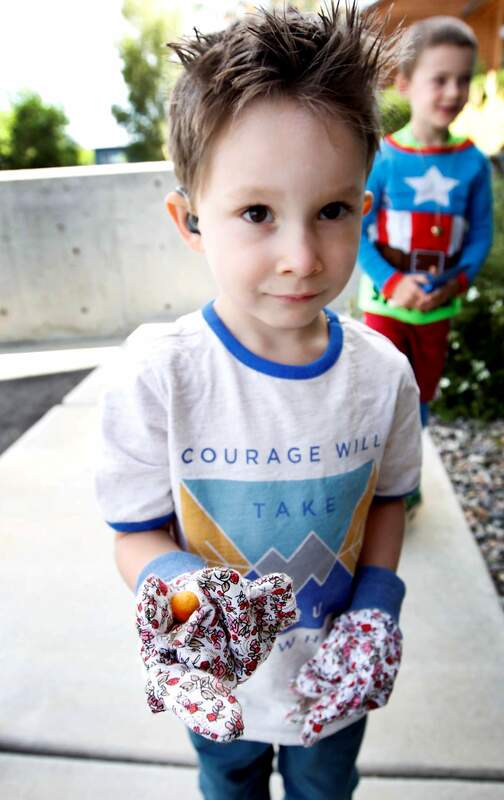 Gunner Winters, 4, holds a tomato that he collected from the Riverhouse Children’s Center garden. 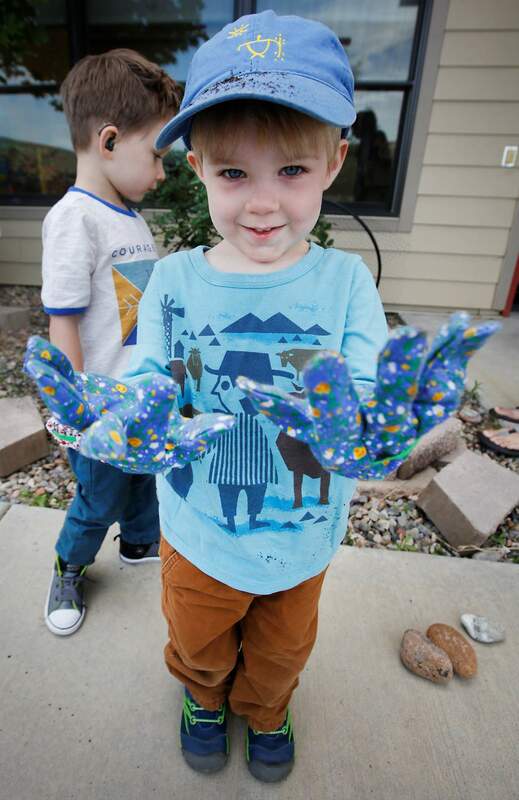 Archer Nicovich, 4, shows off the colorful gloves kids get to wear while working in the Riverhouse Children’s Center garden. 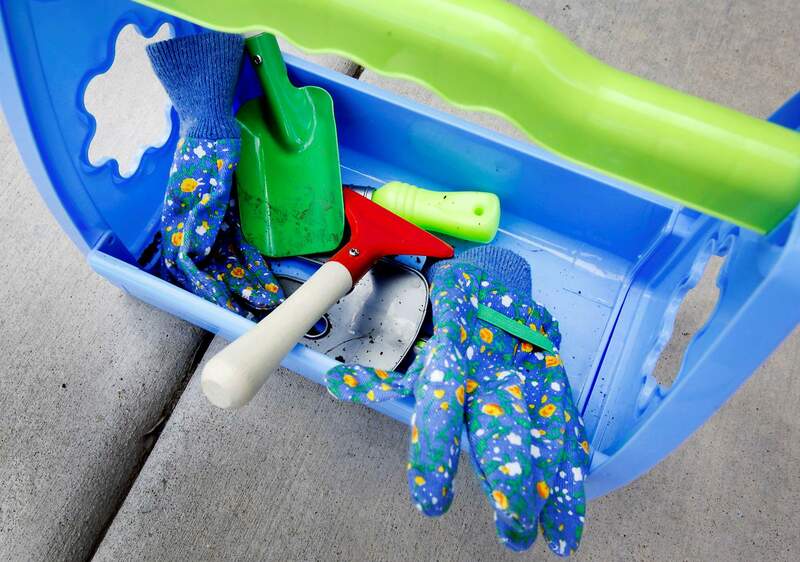 While gardening and mucking in the dirt are great fun for kids, adults use it to teach healthy nutrition choices and lessons about germination and pollination. Child-sized garden tools at Riverhouse Children’s Center make it easy for small hands to tend to their crop, which includes lettuce, tomatoes, radishes and carrots. Angie Downing, a teacher at Riverhouse Children’s Center, works with children in the center’s garden. The garden provides healthy nutrition and a chance to see germination, pollination and other botanical principles in action. Most children love digging in the dirt, and educators are taking advantage of that by including a gardening component to their curriculum in increasing numbers. 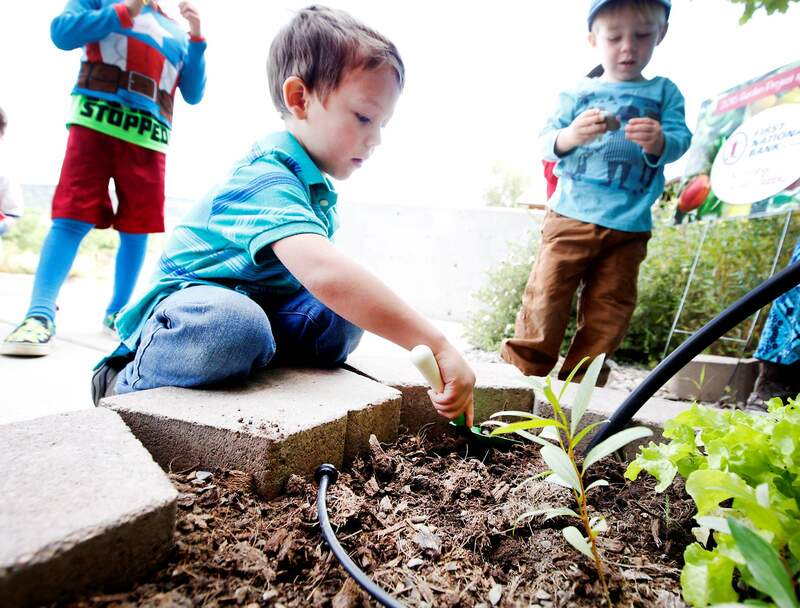 Riverview, Needham and Animas Valley elementary schools have all had gardens for several years, and this year, gardening has been added to the preschool schedule at Riverhouse Children’s Center. According to the Farm to School Network, Riverhouse is joining a growing trend of early education providers who are integrating gardening into their lessons and meal plans. The network surveyed almost 1,500 early care and education sites in 49 states in 2015. The survey found preschool gardens meet two needs for young children – promoting a healthy lifestyle while decreasing the risk of childhood obesity, and providing experiential learning to help prepare students for kindergarten. While those may be adults’ objectives, children of all ages enjoy mucking in the dirt and eating something they have grown themselves, said teachers who work with gardens. Because Riverhouse works with children from 6-month-old babies to pre-kindergarten 5-year-olds, lessons vary based on the rapidly changing developmental stages in that period of life. Many of the school gardens are done in collaboration with other organizations, and Riverhouse is no exception, partnering with Farm to Preschool and Healthy Community Food Systems and Durango Nursery & Supply with financial support from First National Bank of Durango. 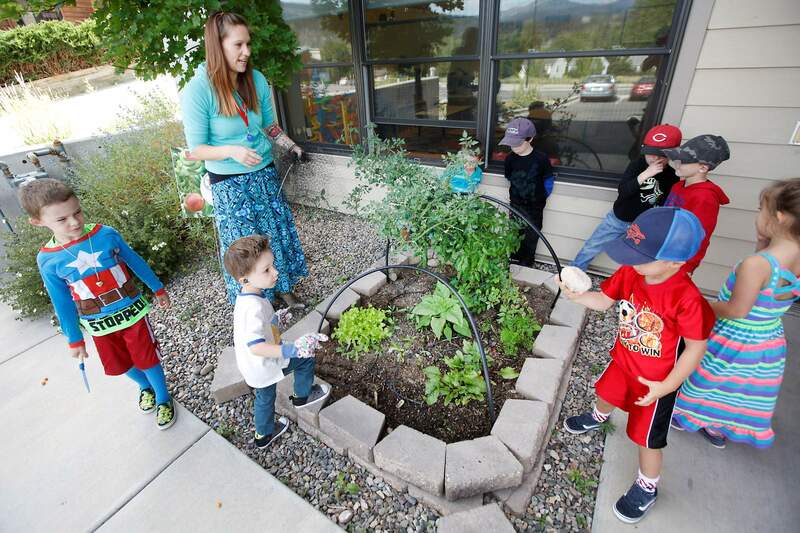 Every garden at Durango School District 9-R’s schools is handled differently, district spokeswoman Julie Popp said. One challenge K-12 gardens have is taking care of the plants during prime growing season in the summer, when school is not in session. Needham’s, which was started in 2007, is managed by the Garden Project of Southwest with help from the Colorado State University Extension Offices in La Plata County. The project held both a junior gardeners summer camp and work days on Thursdays during the summer. The Needham garden has tripled in size since its beginning, with 24 vegetable beds, one for each classroom, six ornamental beds focused on teaching the school’s International Baccalaureate curriculum, picnic tables and rotating art and music pieces. The Animas Valley garden is run by students and staff. And the Riverview garden is located not at the school but down the hill in the Ohana Kuleana Community Garden, another Garden Project location.